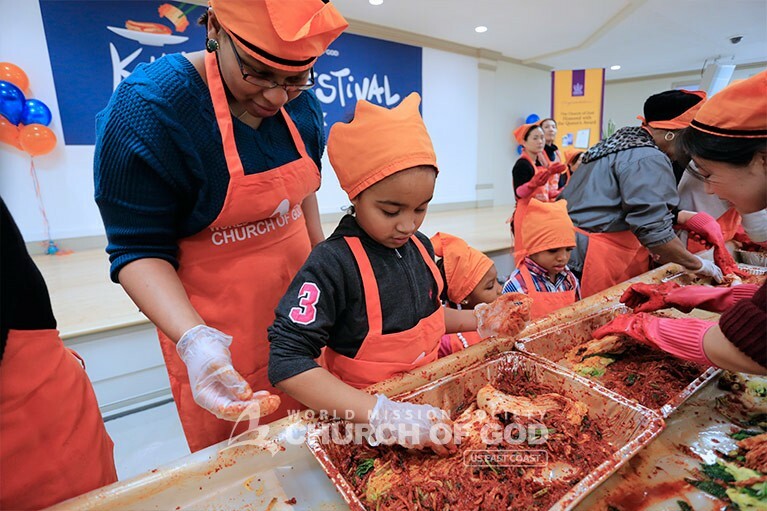 With the cold winter upon us, what better way to prepare than with a hands-on kimchi-making festival? 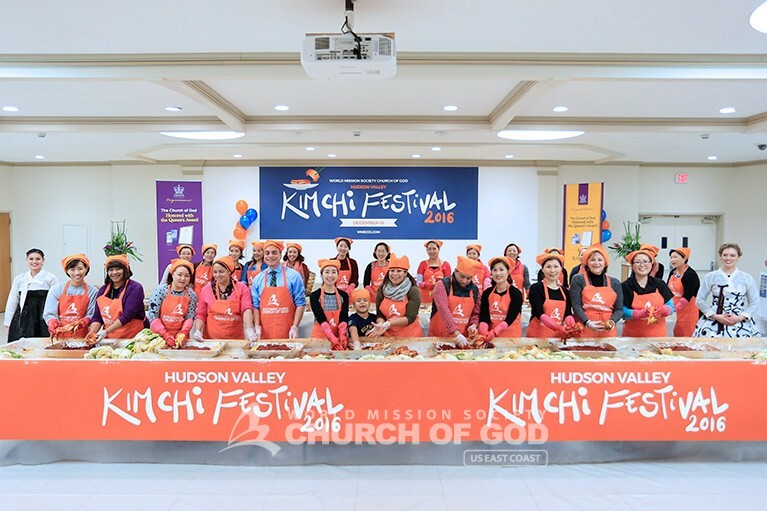 On Sunday, December 18, the New Windsor Church of God hosted the Hudson Valley Kimchi Festival 2016 to bring the community together, promote healthy eating, and continue the global celebration of the Church receiving the Queen’s Award for Voluntary Service. In Korea, relatives and neighbors traditionally help each other prepare kimchi for the wintertime. Furthermore, this tradition brings families closer together and helps develop specials bond among family members. 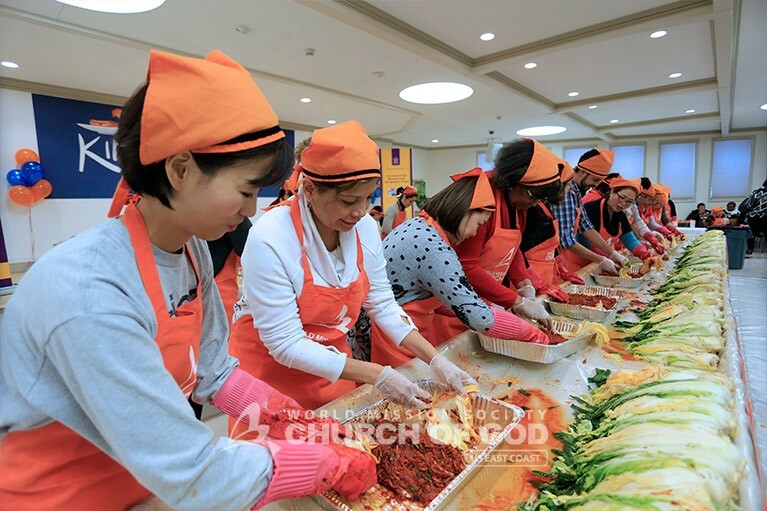 Dressed in festive kimchi-making garments—aprons, headbands and arm-length gloves—instructors guided guests on how to prepare the delicious vegetable dish. Festivalgoers were all able to dig in and mix in the seasonings onto the head of cabbage. While combining the perfect balance of ingredients and seasonings, they made their own kimchi and even took some to go. 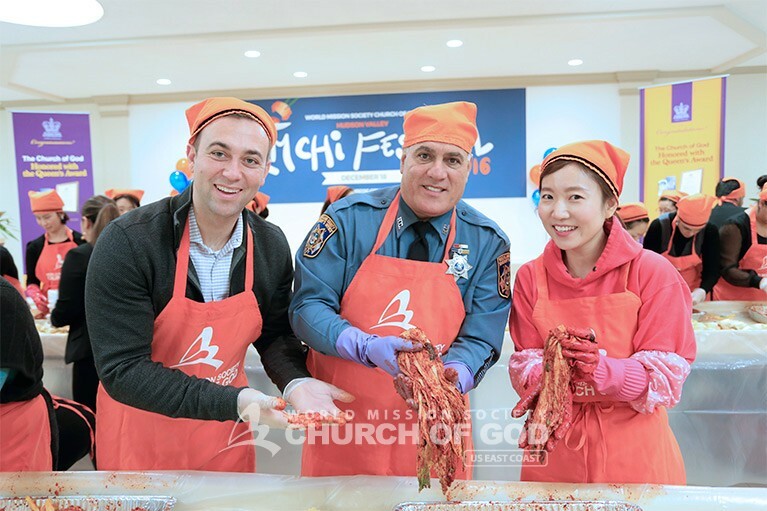 Officer Gerald Verdicchio from the Rockland County Sheriff’s Office making kimchi. Even though kimchi has its roots in the far-off land in the East, it’s clear that its popularity has grown in the West because of its many health benefits. 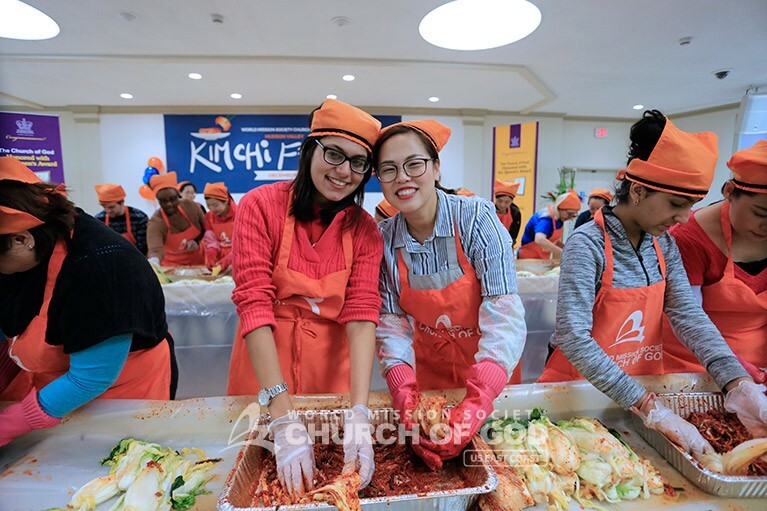 Evidently, many of the attendees were already familiar with kimchi and had been purchasing it or even preparing it at home. Others, though having little exposure to Korean culture, were thrilled to learn how to make Korea’s national dish. Festivalgoers also explored the eight different food stations featuring other famous Korean dishes. Choices included dwaeji bulgogi (marinated grilled pork), gimbap (seaweed rice rolls), galbi (marinated short ribs), Korean pancakes made with seafood and even Bubble Tea. Attendees sampled the various dishes until finding the perfect match for their taste buds. Music was also a major part of the Hudson Valley Kimchi Festival. 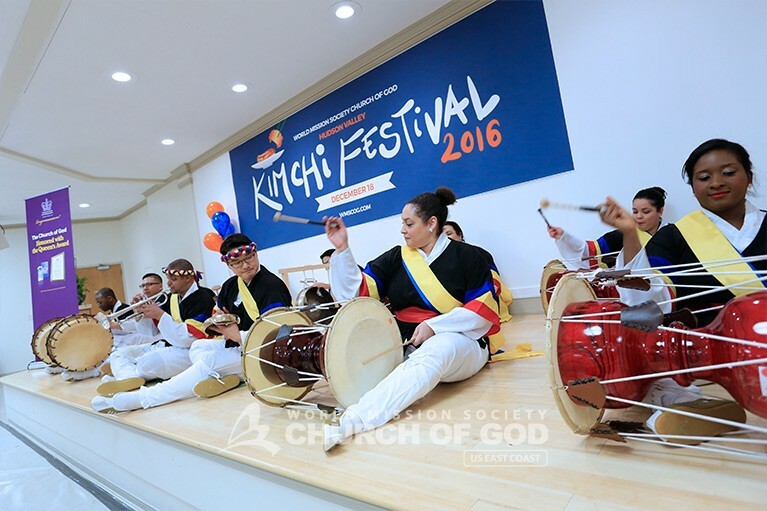 The New York Church of God Orchestra played soothing melodies in the background while participants made kimchi. 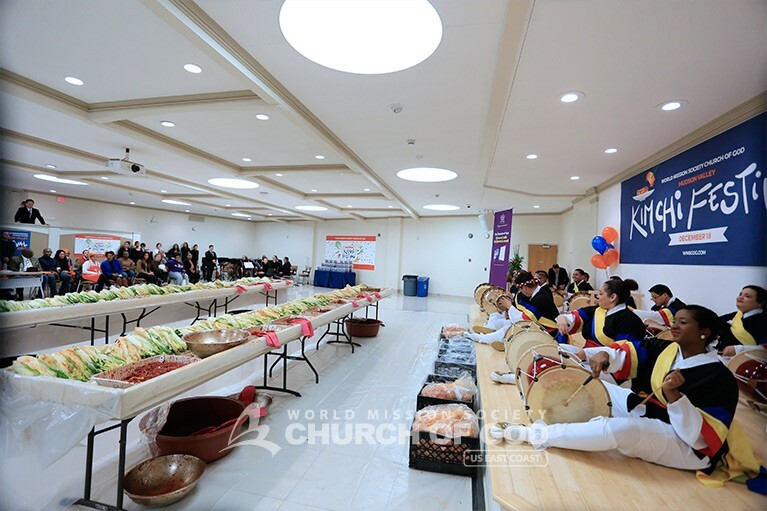 They even played the famous Korean lullaby, “A Baby Lives in the Island.” In addition, Elohim Samulnori, a Korean-style percussion group, dazzled everyone with their thunderous rendition of traditional Korean harvest music. Wow this event looked like so much fun! It’s always a beautiful thing when the community can come together and enjoy each other’s company while sharing a delicious meal. 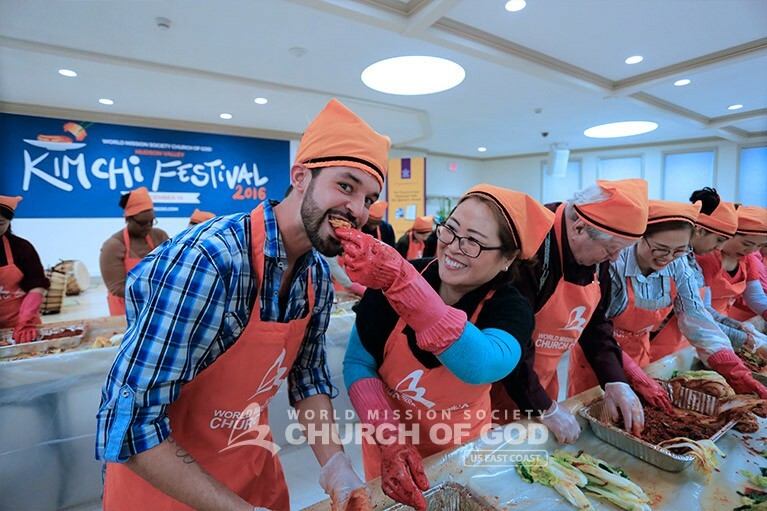 I love kimchi and the World Mission Society Church of God! The World Mission society is really a great church. Whenever I spend time at the church it’s always so refreshing. Everyone is always willing to help and assist you in anything. 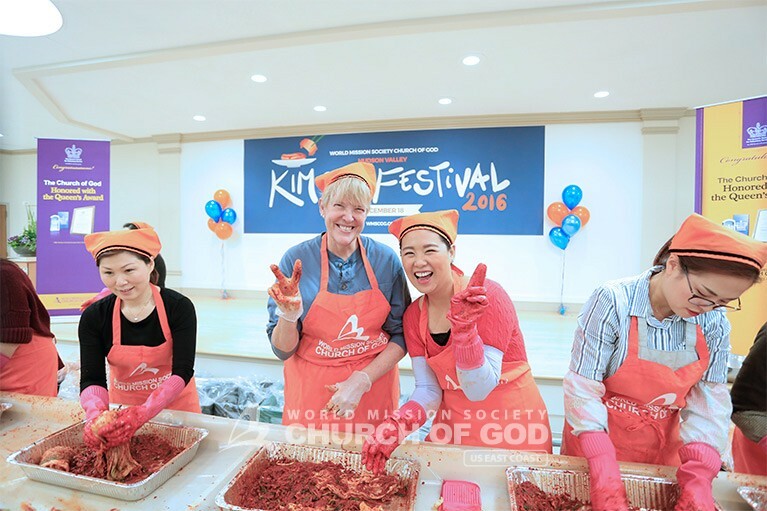 It was fun to attend this event and experience kimchi making…..something I had never really been a part of. I had a wonderful time! I met so many new faces and felt an immediate warmth from all the members from the church. Though many people didn’t know each other at first, instant friendships were made while experiencing delicious Korean-style foods and culture. One family that attended had a younger daughter that plays the violin. As soon as the church leader heard of her talent he immediately stopped the orchestra and asked for her to be substituted in for one of the violinists. The orchestra began another song with their new addition and she wowed the crowd with her ability to immediately mesh right in. Once the song ended, everyone applauded her, as well as her proud parents. That pretty much sums up the kind of warm and loving vibe that resulted from this event. I hope there is another cultural event soon! Thank you for such an amazing day. Another beautiful heartfelt event hosted by the Church of God : ) always showing love to the community with fun, free events giving warmth to this cold world through the love of Mother! A great thanks to the Church of God for hosting yet another thoughtful event to bring together families and the community alike. I was also pleased to see representatives from the local police and fire departments attend the event! This looks like it was a great activity for the members of the community to come together and make new friends and for family members to spend some quality time together. Kimchi is a delicious side dish and when I have felt under the weather I would feel better after eating some. Also the orchestral music sounds like it was very pleasant for the atmosphere. If only more people engaged in activities like this, the world would be a better place. This event was so beautifully prepared. The Church of God truly shows how necessary it is to preach the word through their good actions and deeds. The members really make every effort so that each and every guest feel welcomed through their unity and hospitality. Whenever I attend their events, I really feel welcomed as a guest, and I feel the joy and comfort of a family. World Mission Society Church of God really is a Church that believes in the God of the Bible. Plus, they have amazing kimchi haha! I would highly recommend new people and guests to attend their social events and family gatherings! I had an amazing time at this event. It was my first time making kimchi! I was able to learn many things of the Korean culture. Everyone was so nice and was always smiling. Would really like this event to happen again so I can invite my family! Also congrats on the Queens Award. Wow I heard so many were able to come out and attend the Kimchi making event. Even the Sheriff of Rockland County’s it must have been an amazing event! What is more, all of them who participated in this festival are smiling a bright smile! This evening to was outstanding and really brought the community together. I cannot wait for another Church of God event. Also the fact that the Church received the swath from the Queen is amazing. 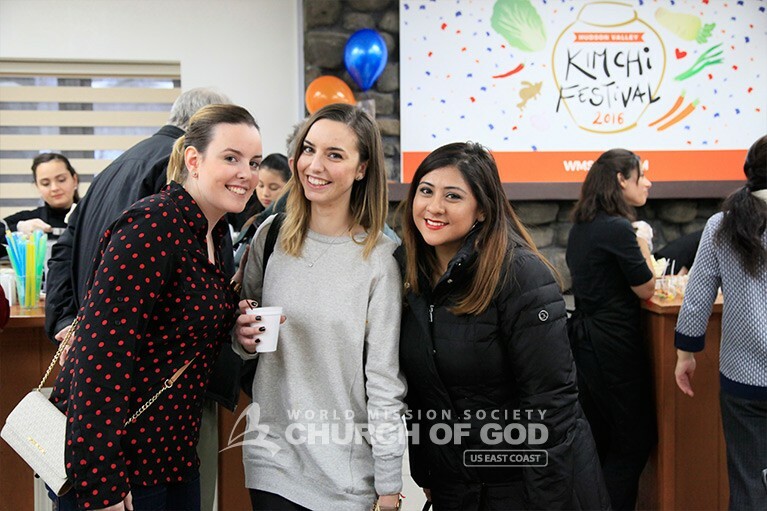 I have been to a couple of events from World Mission Society Church of God and I always come out with the same vibe, pure mind, sincerity, and love for each other. I’m looking forward to other opportunities to attend thw Church of God. Wow that looks so fun! I hope we have one in Louisville too! 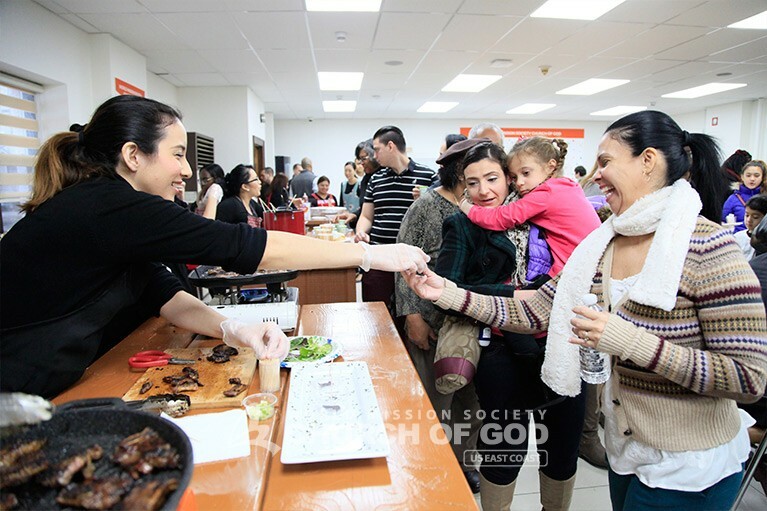 It’s so amazing how the members of the Church of God can come together and celebrate each other’s unique cultures and backgrounds. 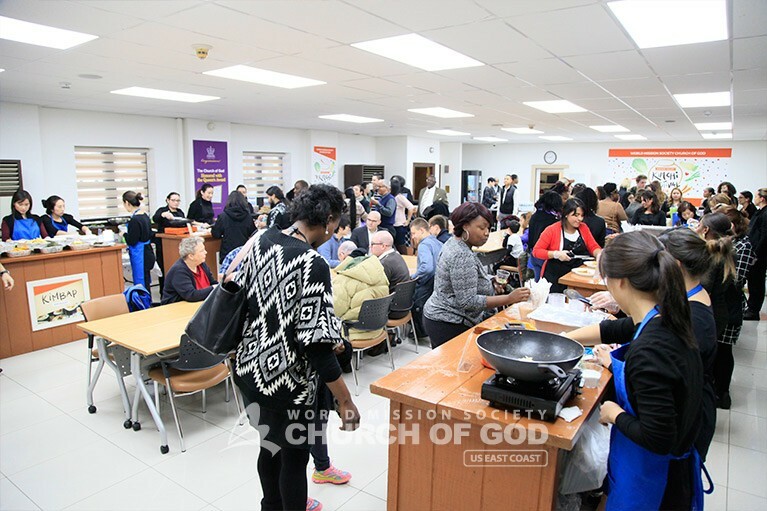 The World Mission Society Church of God is all around the world! Let us show love to the entire world in the example of Mother! Yay kimchi!